There are several differences between trucking during the day versus at night. Driving while on the verge of falling asleep is one of the worst things you could do. Not only is there the threat of falling asleep at the wheel, but it also lowers your reaction time and ability to judge distance. For new truckers especially, long hauls may seem intimidating–and boring. Long driving distances are never exciting, especially if you’ve already driven the route. There’s nothing new, nothing to keep you focused. This is incredibly dangerous. Driving while on the verge of falling asleep is one of the worst things you could do. Not only is there the threat of falling asleep at the wheel, but it also lowers your reaction time and ability to judge distance. For tips to help keep you awake, read on. Food and Drink- While eating and drinking properly before your travels is important, doing so in your vehicle while driving is a major distraction. Spills and messes can cause drivers to move their focus from the road to their cabin, which could result in a major accident. Instead, consume your meals at rest stops to avoid this distraction. Radio- While listening to a radio can be helpful and entertaining, changing stations can cause a distraction for drivers. Drivers should set their station before leaving their lot in order to enjoy the radio without the distraction of changing stations. Smart Devices- Phones, tablets, and GPS systems have helped make our world easily accessible and have made traveling easier for many drivers. However, these smart devices can pose serious distractions for drivers. To avoid these hazardous distractions, set your GPS before you begin your travel. However, you should know alternate routes in case a problem arises with your system. Turn off all tablets and phones before you begin to travel to avoid tempting calls and other distractions. For many truck drivers, one of the worst times to travel is during the night. The bright lights of passing cars can lead to headaches and the long hours can lead to fatigue in drivers. However, for many fleets, traveling at night is one of the major times travel occurs. There is less residential traffic on the roads, which means travel can be easier in some ways. If your fleet tends to travel often in the evening hours, consider these tips to stay safe. Before travel, be sure to have your headlights aimed straight instead of leaving them uneven. This will help your headlights work more effectively during travel. If your truck allows you, dim the lights of your dashboard. This will help avoid reflections that could lead to a distraction while driving. Avoid wearing any type of glasses if possible when driving at night. If you are required to wear glasses, wear a prescription pair that comes with a coating that helps prevent reflection. Choose glasses over contacts when driving at night to avoid irritation and eye strain. Become accustomed to looking for eyes of animals along the side or in the road. The light from your vehicle will reflect in their eyes, so you will be left seeing two bright, yet small, circles in the distance. Eyes will alert you to an animal’s presence up ahead, allowing you to slow down to avoid hitting the animal. Be sure to clean your side mirrors before night travel. Streaks and smudges will only reflect the light of oncoming vehicles, making it difficult to see. Your truck has experienced a breakdown and you need immediate truck repairs. Where do you go? Well, one place you shouldn’t go is to your typical auto repair shop. You need to go to a mechanic that specializes in truck repairs. That mechanic is Middleton & Meads. What’s so great about truck repair shops? 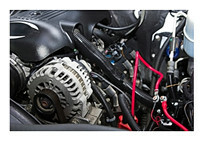 In comparison to standard auto repair shops, an auto shop that specializes in truck repair services will provide you exceptional customer services and make truck repair cost stay within your budget. Our Middleton & Meads’ mechanics save you time and money by providing you one-stop auto repair services for your fleet. We are efficient and reliable for any type of truck repair or trailer repair. We can tow your trucks. We complete quality tire services and replacements. Middleton & Meads can help you refuel on a budget and more. Our truck solutions even include preventative maintenance and diagnose for major truck issues. Mechanical repairs, collision repairs, fleet management are all provided at our one-stop auto repair shop. No long-term contracts. No enrollment fees. We are all about getting you back on the road safely and quickly as possible. Bring your fleet commercial vehicles to us today; we specialize in serving trucking companies. Our mechanics are known for being trustworthy and reliable when it comes to heavy-duty truck and trailer repairs. Do your employees need transmission training? If yes, you are in luck. The Maintenance Council will host an Allison Transmission training in two weeks. Here at Middleton & Meads, we highly recommend that MMTA Maintenance Council Members and MMTA Members join the training session. Neil Middleton is the Chairman of MMTA’s Maintenance Council. Neil will be hosting the Allison Transmission training on Wednesday April 3, 2013. The Allison Transmission Training will take place at Middleton & Meads. Those attending the event will learn about inspection tips, Allison DOC, troubleshooting tips, preventative maintenance and J-11939 data link. The Transmission training will also feature the expert speaker Ron Strobel, Senior Business Development Manager of ATR, Inc. ( Authorized Transmission Re-manufacturing, Inc.). Mr. Strobel will be conducting the seminar and the Q& A. Space is limited to only 30 members. So RSVP today! Reservations are required by April 1,2013. The Allison Transmission Training is sponsored by Middleton & Meads and K. Neal Idealease. 410-752-5588 or click here today for information. As the warmer weather comes, people will be out and about on school field trips, vacations and work summits. Most likely this will involve reliable bus transportation. During this time of the year, bus collisions are very common. If you do experience a bus collision, you should not leave bus collision repairs in the hands of any untrained body shop. Damaged Transit buses, School Buses, Shuttle Buses and Tour buses come with very hefty transit vehicle expenses because buses come with unique vehicle features. Some unique vehicle features buses include are sophisticated air brake systems, air operated door systems, multiplexed control systems, complex wheel chair platforms/ lift systems and state of the art HVAC systems. What happens when a bus experiences a bus collision? After a bus collision occurs (bus accident or bus fire), one or multiple systems in the bus will need repairing, as well as the structural bodywork of the bus. Proper bus collision repairs, you will need to hire an experienced bus technician to diagnose and repair all the bus systems. Middleton & Meads can handle your minor bus repairs and your major bus repairs at a competitive price.